We offer a great selection of cluster box unit apartment mailboxes for sale online, for commercial and residential apartment use. 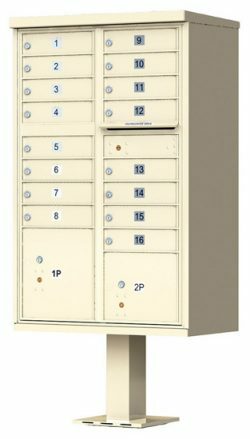 Our inventory includes vertical apartment mailboxes (from 3 – 7 doors wide for smaller apartment buildings) and 8 – 16 door pedestal CBU mailboxes (with parcel lockers), plus mail collection boxes and key keepers. If your project is an apartment or condo complex, or any type of residential or commercial multi-tenant building that requires a centralized mail distribution center with multi-unit mailboxes, check out our line of USPS approved apartment mailboxes for sale here at MailboxWorks. Available with standard USPS doors, vertical mailboxes are less common today but still often used in smaller multi-unit apartment and condo complexes. The MailboxWorks also carries engraved address tags for vertical mailboxes. USPS approved and designed, and manufactured by Auth Florence Manufacturing, North America’s leading supplier of secure residential and commercial mailboxes, CBU apartment mailboxes are highly secure, locking pedestal mailboxes that meet or exceed USPS standards, making them ideal for indoor or outdoor centralized mail delivery. Along with installation in multi-family residential complexes, apartments, and condos, CBU apartment cluster box units are also commonly found in business and industrial complexes that require multi-unit apartment mailbox systems. 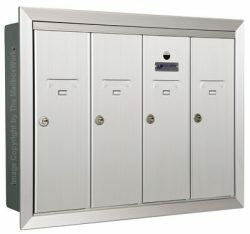 CBU apartment mailboxes are installed with a Postal Master lock for USPS mail delivery. According to the United States Postal Service (USPS) STD-4C regulation requirements, it is mandatory for all new commercial construction requiring centralized USPS mail delivery, plus any commercial building or multi-tenant apartment complex undergoing major renovations (that have centralized USPS mail delivery) to install 4C horizontal mailboxes. 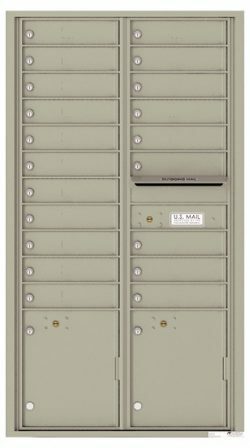 4C multi-tenant mailboxes by Auth Florence Manufacturing are USPS approved and meet height and postal carrier accessibility requirements. They can also be utilized for private mail distribution in places like college and university mailrooms or some office situations. All USPS approved Florence 4C apartment mailboxes are manufactured with a modular design so centralized mail distribution centers can easily be configured for virtually any project to accommodate various resident box sizes as well as parcel lockers and outgoing mail drop boxes. Even the mailbox compartment sizes are modular so individual mailboxes can be customized in numerous door sizes. Need Help with Apartment Mailboxes? The MailboxWorks can help you find the right apartment mailbox system for your project regardless of the number of tenant mailboxes you need or the mounting or mail distribution method you require. Talk to our mailbox professionals at any time by calling us Toll-Free at 1-866-717-4943 or complete our online mailbox contact form if you need help with your order or with your apartment mailbox layout.